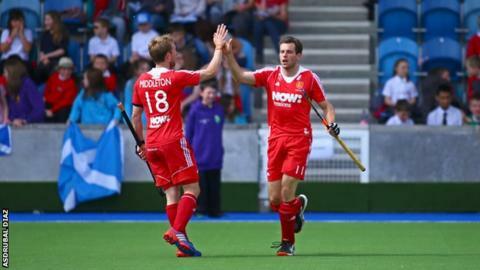 England's men eased to a 5-1 win over an inexperienced Scotland team in their final match of hockey's Four Nations tournament in Glasgow. David Condon scored twice for England while Ashley Jackson, Simon Mantell and Alastair Brogdon also found the net. Wei Adams was on target for Scotland. The result meant England finished in third place and Scotland fourth. Belgium won the tournament overall after a 4-0 win over Argentina in a shootout after their match ended 2-2.